Make sure Bangalow is on your list of places to visit - bring your wallet and make sure there is free space in your suitcase as it's speciality shops and gift stores are sure to tempt you. It is a very pretty village surrounded by rolling green hills, working farms, and dominated by it's sloping main street which hosts it's annual Billy-cart Derby in April, and is a great place to spend Christmas Eve with it's ever popular Street Party. 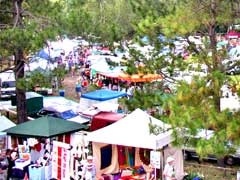 It is one of the villages which hosts the local Sunday Markets which rotates from Byron, then the Channon, then here on the 4th Sunday of every month. The 1st Sunday of the month, the market takes a break. The markets are extremely popular and offer a vast array of local produce, home made delights and locally crafted wares. 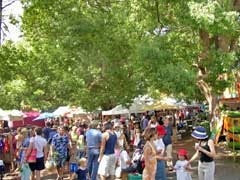 It has arguably the best venue for the markets being in the Showgrounds which are pretty, well shaded for those hot sunday afternoons and close to the centre of the village - when you've had enough of shopping and want to sit back with a coffee and watch the world go by. The Showgrounds also boasts the A&I Hall the Agricultural and Industry Hall. A historic hall which hosts many events not least being the annual North Coast Jazz Festival in June. There is one pub in the village, previously called the Byron hotel - too confusing for most so it's now known as the Bangalow Hotel. It sits at the top of Main Street and serves great food and has just extended with a very stylish mezzanine/outdoor dining area. There is a local farmers market every Sat morning from 7 - 11am if you fancy some fresh local produce. Or you can just watch the shoppers from the back Balcony of the Hotel as the market is located just behind in the Car park. Another popular event in the village is the Bangalow Billycart Derby - it's held every May. This year it's on 18th. The quickest way to get here from Byron is along the highway, but by far the best way is the Old Bangalow Road, it's a winding scenic drive and well worth the extra effort. Head south out of Byron, on the way to Suffolk Park and Lennox head and follow the signs turning right just before Byron Bay Golf Club and just after the Red Devils Football Club ground. Or there is the even older Old Byron Road where you turn right before getting this far, where Hulala Cafe is and the turnoff for Lillypilly and Byron Bay Cemetery. Turn left before reaching the cemetery and entering Lillypilly - just after crossing the railway line - does any of this make sense? Don't worry, it will..